It’s good to be back making cocktails again on a more regular basis now that we’ve finally had two seconds to sit down after this whirlwind book tour for Flapper Pie and a Blue Prairie Sky. It was a helluva ride and Karlynn did a ton of media. Now that we’re home, I wanted to get back into more regular cocktail recipes and of course, being big fans of bourbon sours, I figured I’d start with one. I did a Canadian spin on this particular drink and included a Canadian staple.. maple syrup in the drink to give it a sweet note. I think you’ll like it. 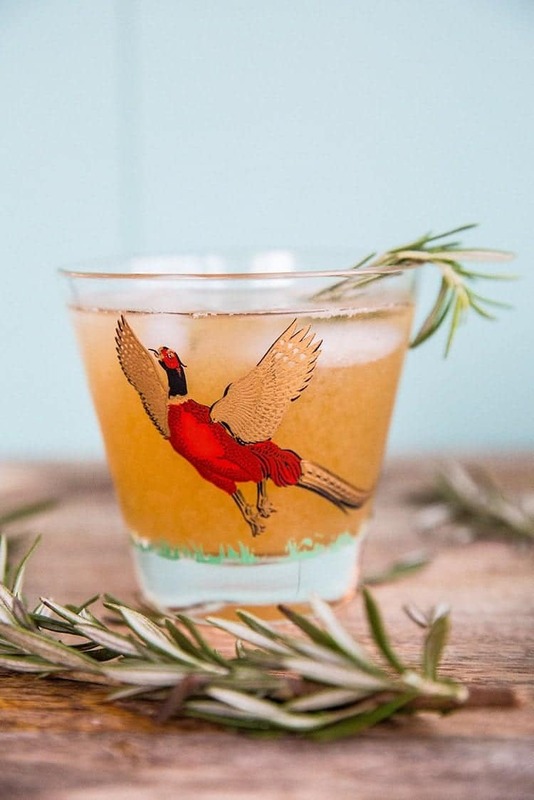 We also used one of my favorite cocktail glasses for this shot, the much coveted pheasant glasses. I love these things, they are just awesome. I think I own the whole set now as we tend to immediately buy anything similar for our bar-ware collection (which you’ll see throughout these recipes). Speaking of which, let me know in the comments if you think a bar-ware index would be something you’d enjoy seeing. This sour consists of Jim Beam Bourbon, maple syrup, Sortilege (so good and a staple in our house!) and lemon juice. 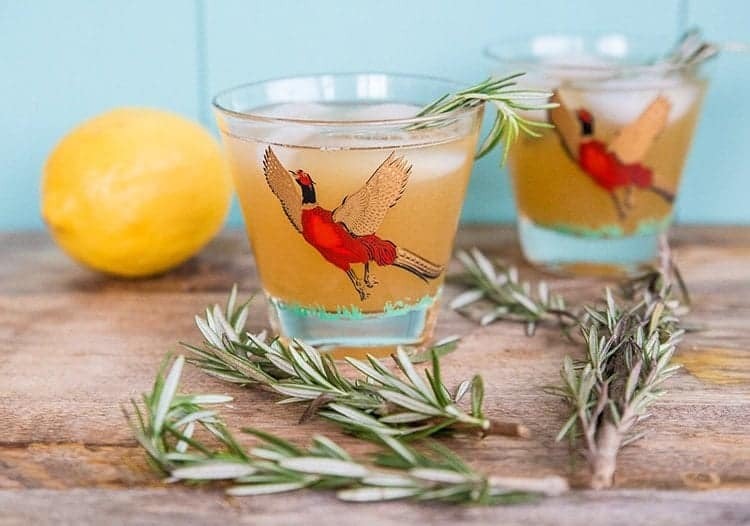 I added in some rosemary to give this drink a savory note and it’s an absolute must. The amounts in the recipe below are enough for a total of 4 drinks because 2 definitely isn’t enough! Karlynn likes an added shot of Sortilege in hers ( she says it’s for sweetness…..but do we really believe her?) so make sure to adjust it to your liking. I like a bourbon sour that makes your face pucker up like Popeye’s face, but you might not. Add more maple syrup or Sortilege to taste before straining! PIN THIS RECIPE to your COCKTAIL RECIPES Boards and Remember to FOLLOW ME ON PINTEREST! Nothing says cold weather cocktail like maple syrup and bourbon! Add in some rosemary for a savory note and you have a new favorite for the holidays! Crush two sprigs of rosemary in a large measuring cup (enough to hold all of the ingredients) with a muddler. Add in bourbon, maple syrup, Sortilege maple whiskey and lemon juice. Taste and see if it's sweet enough ( this can be sour!) and add more syrup or hey, Sortilege if you like, to bring it to your desired level. Strain into a clean pitcher. Add ice to glasses, pour over ice. 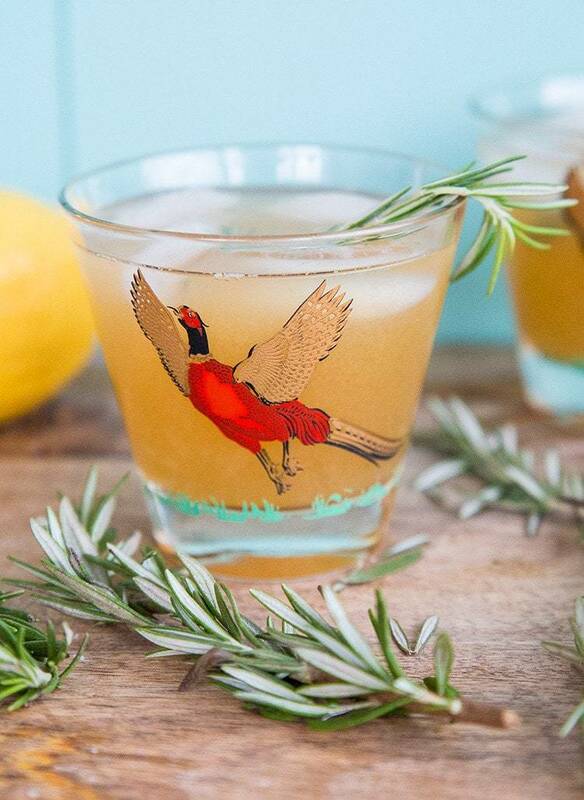 Add a sprig of rosemary and a slice of lemon for garnish, if desired. Five stars! Glad that I can get the maple whisky!